June 9, 2015 1:30 P.M. Starting July 1, 2015, Ontario will be the first jurisdiction in North America to protect bees and other pollinators through new rules to reduce the number of acres planted with neonicotinoid-treated corn and soybean seeds by 80 per cent by 2017. To support this goal, new requirements will be put in place for the sale and use of neonicotinoid-treated corn and soybean seed that will help ensure treated seed is only used when there is evidence of a pest problem. Reducing neonicotinoid use in these two crops presents the greatest potential to reduce pollinator exposure to the neurotoxic insecticide. Pollinators, including bees, birds and butterflies, play a crucial role in agriculture and our ecosystem. Over the last eight years, Ontario beekeepers have experienced unusually high over-winter losses of honey bees, reaching 58 per cent following the winter of 2013-14. The level of over-winter losses considered to be acceptable and sustainable by most apiculturists is 15 per cent. The new rules are one part of Ontario's strategy to improve pollinator health. The province will also develop a pollinator health action plan in consultation with the public and experts to address other stressors that affect pollinators. Ensuring a strong and healthy agricultural sector is part of the government's economic plan for Ontario. The four part plan is building Ontario up by investing in people's talents and skills, making the largest investment in public infrastructure in Ontario's history, creating a dynamic, innovative environment where business thrives, and building a secure retirement savings plan. There are more than 400 pollinator species in Ontario and bees are the most common pollinator. 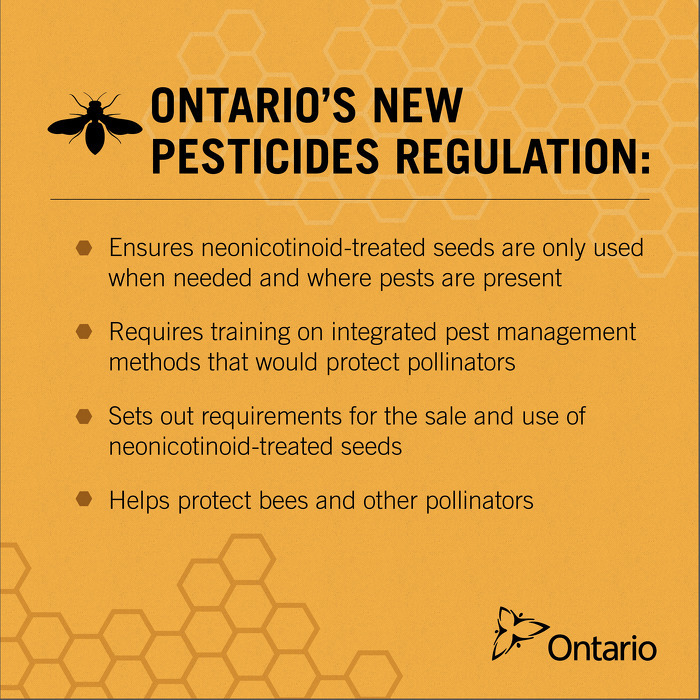 The province conducted a comprehensive, two-stage consultation process with the public and stakeholders to develop its neonicotinoid regulatory requirements. Neonicotinoid-treated seeds are widely used in agriculture. Close to 100 per cent of corn seed and 60 per cent of soybean seed sold in the province is treated with neonicotinoid insecticides. This document was published on June 09, 2015 and is provided for archival and research purposes.